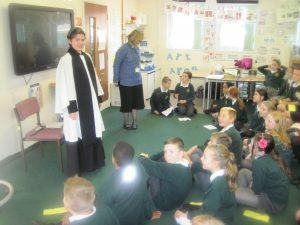 As a school with a Church of England foundation, we naturally regard the religious education of our children as being of real importance. 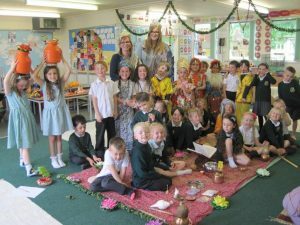 Religious education in our school is based upon the syllabus agreed by the Local Education Authority and the Diocese of Bath and Wells, “Awareness, Mystery and Value”. This encompasses a number of different faiths and practices with Christianity lessons being delivered using the exciting new resource “Understanding Christianity”. The daily act of worship forms an integral part of each day and follows a number of themes throughout the liturgical year. 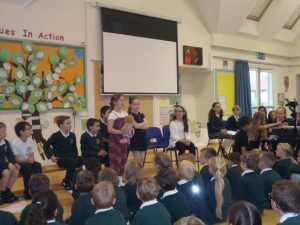 Children help in most acts of worship by organising the music, leading the weekly ‘Celebration Worship’ and performing Bible stories to an audience. We are frequent visitors to the church for singing practise and services at Harvest, Christmas, Easter and the end of the academic year. Parents have the right to withdraw children from religious education lessons and collective worship.